In medium bowl, mix egg white and Buffalo wing sauce. Stir in chicken. Cover; refrigerate 30 minutes. Line cookie sheet with waxed paper. In large resealable food-storage plastic bag, place Bisquick mix, cornmeal, salt and pepper. With slotted spoon, remove 1/4 of chicken pieces from bowl and add to bag; seal bag and shake to coat. Repeat with remaining chicken pieces. Tap off excess Bisquick mixture and place chicken on cookie sheet. In small bowl, mix dipping sauce ingredients until well combined. Cover; refrigerate until serving time. In 10-inch nonstick skillet, heat oil (1/4 inch) over medium-high heat 2 to 4 minutes. Cook chicken bites in oil in batches, about 1/3 at a time, 3 to 4 minutes, turning once, until golden brown. Drain on paper towels. Serve chicken with dipping sauce. Cut chicken into strips instead of 1-inch pieces; cook 5 minutes longer. The chicken bites can be breaded ahead of time and then cooked just before serving. Prepare up through step 2; refrigerate until ready to cook. 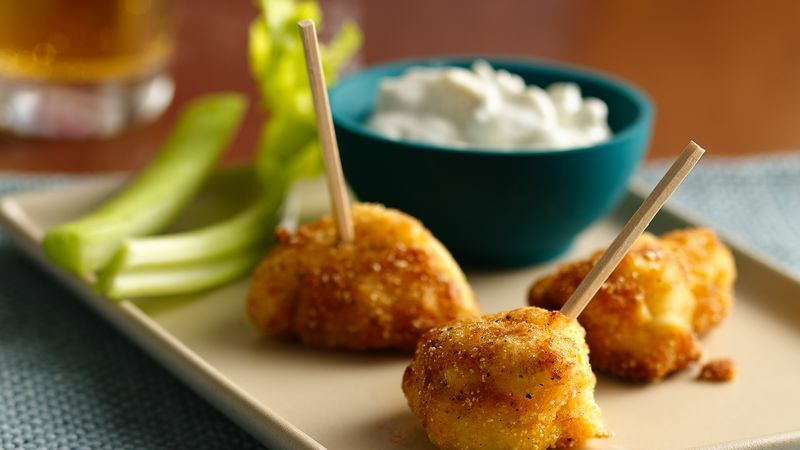 Turn the Buffalo Chicken Bites into a great salad—serve over chopped lettuce and tomatoes with the dipping sauce for dressing.